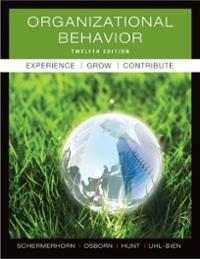 Organizational Behavior 12 Edition The new edition of Organizational Behavior includes a rich array of exercises, cases, and applied materials such as the Kouzes and Posner Leadership Practices Inventory and Pfeiffer Annual Edition exercises available in the OB Skills Workbook. It also focuses more on the hot topic of ethics throughout the entire book to ensure it is contemporary and engaging. The text also introduces two brand new key features ‘Finding the Leader in You" and "Taking it Online". "Finding the Leader in You", discusses leading in the workplace in a personal and applied way. The goal is to make the material more relevant and applicable to today's readers. The "Taking it Online" feature will take the reader from the book to an online case, activity, self-assessment, or video clip of the leader they are reading about.